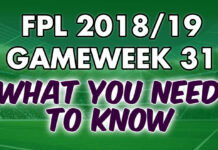 We are now way beyond half way through the Fantasy Premier League 2018/19 season! Time flies when you’re having fun. There is still the January transfer window to take into consideration as well as blank gameweeks looming in Gameweek 27 and Gameweek 31. 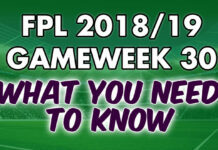 Firstly, we take a look at each fixture from Gameweek 23 and analyse the chance of each team’s victory. We then move onto captain choices. Spoiler alert, Mohamed Salah is the obvious choice. For a full fixture difficulty breakdown over the coming weeks check out our Fixture Difficulty Matrix. The 49 point average was down on the 54 points the previous gameweek produced. Despite being away to Tottenham, the most transferred in player for the gameweek was Marcus Rashford. Here is evidence of the theory form over fixtures. The on-form Man Utd striker returned 7 points. Due partly to Tottenham facing a red-hot Man Utd team, Mohamed Salah was the most captained player. Even facing a Brighton team, who having a good defensive record at home, wasn’t going to stop FPL managers captaining the Egyptian. As he has so many times this season already, Salah came up trumps and returned 11 points after his match-winning penalty. The star player for Gameweek 22 was an unexpected one. 20 year old Declan Rice scored the match-winner in a London derby against Arsenal. This, along with clean sheet points, and a subsequent three point bonus, saw him score a week high 15 points. Fantasy Premier League Gameweek 22 overview! Here is our Fantasy Premier League Gameweek 23 cheat sheet. When taking into account the likelihood of starting, Mohamed Salah is the clear captain choice for Gameweek 23. A home fixture to Crystal Palalce, albeit against a resolute side, and the fact Salah already has 162 points to his name, means if you have the Egyptian, captain him! Sergio Aguero would be a close contender to Salah. However, Man City’s main striker may have to sit on the bench behind Gabriel Jesus. The 21 year old has scored 6 goals in his last 2 games for City. If Aguero does start then the bookmakers have him as an almost equal chance of scoring as Salah does. It is also worth noting Huddersfield sacked manager David Wagner after their Gameweek 22 fixture. Other captain contenders include Marcus Rashford and Paul Pogba. Both are certain starters and have been accumulating FPL points in abundance recently. However, the bookmakers are slightly more pessimistic on their chances of scoring with respective odds of 42% and 40%. With that said, they won’t be the most popular of captains. Therefore, if you need to gain ground in your league both should be strongly considered. With Liverpool at home, Salah will almost certainly be the most popular captain pick for GW23. Double digit figures in 5 of the last 7 gameweeks speaks volumes.